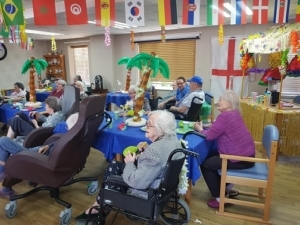 At Venturi Healthcare, it is important to us that we recognise and celebrate all different cultures and beliefs, as such this year Byron Court Care Home welcomed in the Chinese New Year in style! The catering team cooked up a storm and the Residents were able to bring in the New Year with Chinese treats for lunch, there were compliments all round for the chefs for their exemplary efforts. The dining room was decorated with lanterns by the Activity Team with the help of the Residents and everyone had meaningful conversations learning some interesting facts about the Chinese New Year. Following the bleak weather from the winter months, we thought we would bring a little bit of sunshine to the home with an indoor beach party. The dining room was decorated with palm trees and flags from all the exotic countries from around the world. The Residents played games and talked about their travels from past times. Their was a beach bar set up for those who fancied a little tipple in the sun! So far February has been an exciting month for the Residents of Byron Court and we are all looking forward to what is planned next! https://www.venturihealthcare.co.uk/byroncourt/wp-content/uploads/sites/10/2018/09/byron-court-300-80.png 0 0 Jenna Bethell https://www.venturihealthcare.co.uk/byroncourt/wp-content/uploads/sites/10/2018/09/byron-court-300-80.png Jenna Bethell2019-02-22 13:56:042019-02-22 13:56:08Fantastic February! 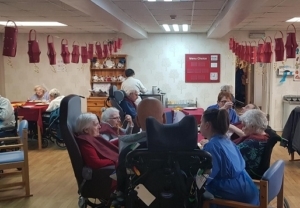 2019 for the Residents of Byron Court Care Home has been jammed packed with in house activities and adventures to points of interest in the local area already! We kicked started the year with the hugely successful visit from the local Brownies that was organised by the Activity Team, Residents thoroughly enjoyed the day. They started off with arts and crafts and the Brownie team spent some quality time with the Residents engaging to conversation about their Christmas festivities. The Activity Team at Byron Court are constantly thinking of innovative ideas to engage with the local community in Bootle. It is an excellent way to ensure each day is different for those living with us at the home, they can have meaningful conversations and engage in a variety of activities. I am very proud of the work the Activity Team complete to ensure our Residents live a fulfilled life. Later in the month, Residents hopped on to the OOMPH! minibus and chose to visit the local arcades to try and win big! 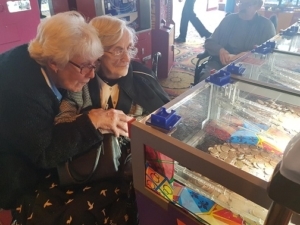 Some Residents focused their attention on winning toys for their loved ones, whilst others couldn’t tear themselves way from the 2 pence machines. Venturi Healthcare have their own minibus so Residents are able to go on day trips on a regular basis. We also partner with OOMPH! Wellness and Out and About who organise two trips per month of the Residents choosing. The feedback has been magnificent and we are really pleased we have signed up with OOMPH for another fun filled year!